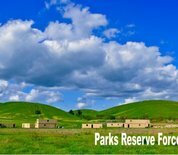 The Parks Reserve Forces Training Area is located in Dublin, California. It serves as a training area for Army Reserve personnel and contains classrooms, ranges and other training facilities to support this mission. Units at Parks include the 91st Division Training Support, the 104th Division and the 368th Military Intelligence Battalion. This Parks Reserve Forces Training Area directory features the critical info you’ll need to navigate through the many facilities and recreational opportunities available on base.